On Monday (August 20), a post from Cocktales (a business section of InterAksyon site) stated that effective September 1, Banco de Oro will charge 2 peso for every ATM withdrawal from any BDO terminal. This was regarding a notification being flashed over the bank's more than 1000 ATM terminals. This information caused uproar once it made its way to the social networking sites such as Facebook, Twitter and the blogging community. BDO was immediately criticized for the policy they will be implementing. I also reacted when I read the article and was planning to migrate my savings account if this is really true. As much as I would like to verify the issue personally this same day, all branches are currently on holiday due to Ninoy Aquino Day. BDO was able to clarify later that the 2-peso fee will only be applied to BDO Cash Card only and not to savings ATM card. So what's the difference of the savings ATM to Cash Card ATM? 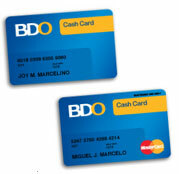 BDO Cash Card is a re-loadable prepaid electronic debit card. Without having to open a deposit account, you can enjoy the security and convenience of an ATM card - withdraw money and pay even without cash. Just to be sure, I have taken a picture of the notification shown over an ATM terminal in our office building. This gives me a peace of mind since I have been banking with BDO ever since I was a student and it's really sad if I will be moving to another bank if they really implemented something unreasonable charging for using your own money.